We had to make a quick trip to Santa Fe today. 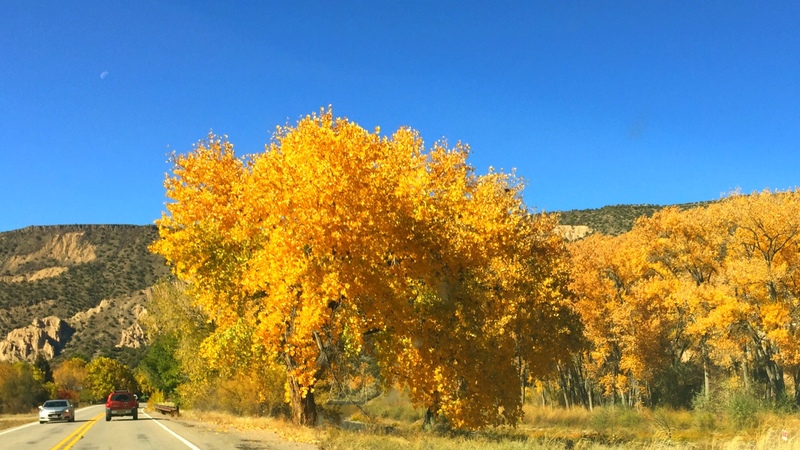 The drive down was the best show we've seen in terms of golden cottonwoods. Simply beautiful. All the way from Taos to Santa Fe. Did you notice the moon? A great lunch with Cousin Ann Lawrence at La Fonda was followed by necessary shopping and errands and we're back home, tired but smiling after a nice, uninterrupted day together. Welcome back to the daily grind, amigo. Great shot! Yes, great shot. Better to BE there! Gold, Gold, Gold. Hi Cheryl, yes, it was a beautiful drive. Beautiful. Your eyes and camera catch it all.